The warm dry Saturday gave me an opportunity to do a major project on my sailboat. 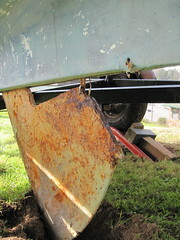 My boat has a shoal (shallow) keel with an iron centerboard that swings down when sailing. It looks like the 170 lbs. cast iron board has not been removed in 35 years. After putting the trailer up on wheel ramps, I chained the trailer to the truck and the boat to a tree. Then with a come along, I slid the boat back on the trailer to allow the centerboard to drop behind the axle. It worked like a charm, except that the boat wasn't high enough to allow the centerboard to drop all the way. Nothing that a quick hole in the ground couldn't solve. I was surprised to have the board out and ready to be sandblasted in one day. I still have a few more projects to complete before I am ready to put the boat in the drink. Ugh. Must not have been stuck? How are you going to hoist that 170 pounder back into place. Don't drop it on your foot!